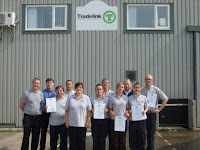 Employees at Tradelink Direct Ltd, whose Head Office is in March, Cambridgeshire have achieved a range of NVQ qualifications through West Suffolk College; the majority of the candidates completed the GQA NVQ Level 2 in Production of Glass Supporting Fabrications, with others achieving Team Leading and Management NVQs. Divisional Manager Ray Sinclair presented certificates to the successful candidates at a recent informal ceremony at the firm’s Mildenhall premises. 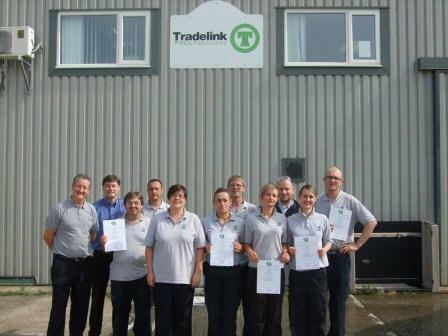 Tradelink Direct Ltd is a well-known manufacturer of PVCu windows and doors, established 19 years ago. Tomasz Bobrowicz and Stephen Brown from Mildenhall and Aleksandra Kubiniec from Newmarket. Gabriel Carvalho, Stanislavs Filipovs, Jolanta Klisiewicz, Susana Magna Sousa and Manuel Vieira, all from Thetford. Ray Sinclair, Divisional Manager of Tradelink Direct Ltd, said: “The journey for the company and our staff has been hard work but very rewarding in a number of ways, from improved skills for the company to individual personal development. “I have seen individuals blossom as they realise they can progress within the company and gain recognised academic qualifications. : [Picture - L to R] Ray Sinclair (Divisional Manager), Gary Robertson (Assessor), Gabriel Carvalho, Stephen Brown, Joanne Reeder, Susana Sousa, Stephen Allaway, Jolanta Klisiewicz, Tomasz Bobrowicz, Aleksandra Kubinec, Stanislavs Filipovs.